I'm a Web Developer Graphic Designer Thing Maker living in Brooklyn, NY. In my spare time, I play indie games eat at hole in the wall restaurants explore the city and pet every dog I meet watch arthouse films have a billion side hustles. Talk to me about functional programming accessible design CNC machinery and comic books postmodern literature sewing projects. I'm currently an SDE at Amazon a graduate of NYU's ITP Master's program a person with way too many hobbies. 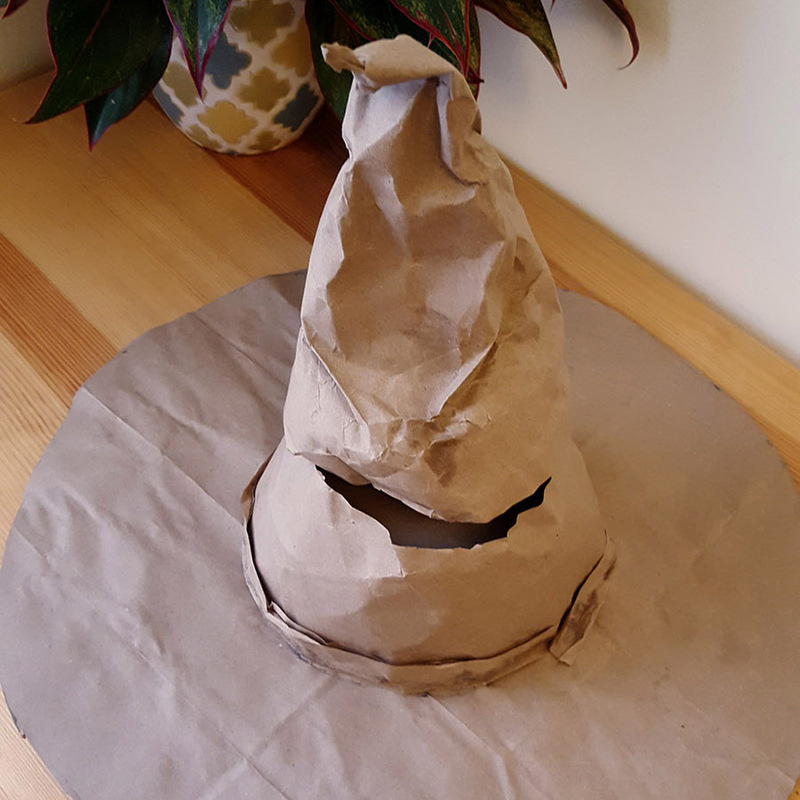 I wear a lot of hats, though. I also Program Design Make Things. In my second semester at ITP, I took a course on digital oracles and fortune-telling. For non-believers, the course seems outlandish, but there is a core truth to it that even the most ardent atheists could not deny: the black box of machine learning algorithms can feel like magic and prophecies. This was one of the ideas that led to my final for the class, Fortune Tinder. Many apps purport to match you with someone compatible– but the measures they use are kept secret from their users. How distinguishable is that from fortune-telling? 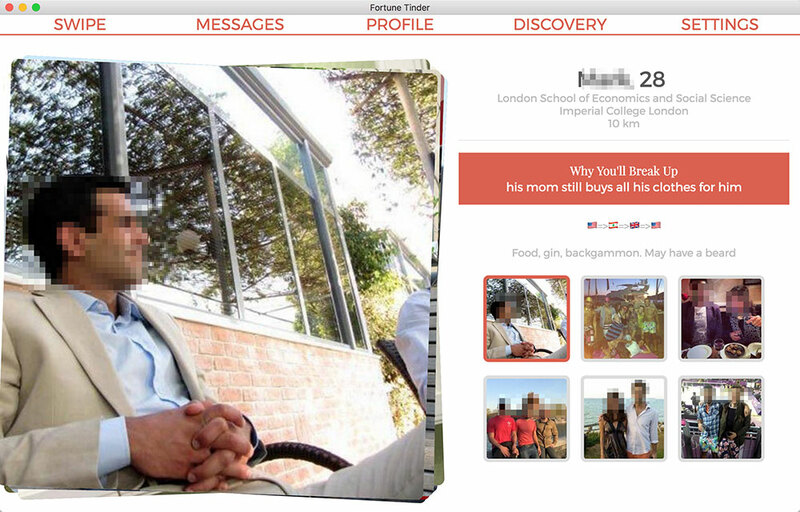 Another impetus for this project was Tinder and the source code I modified to create the app. It’s no secret that the founders of Tinder and the tech industry in general have a misogynistic streak, and Tinder simply becomes another platform on which men can date and disrespect women. The web app I modified is often used by men to automatically woo women– it’s been used for autoresponders and autoswipers. There’s a certain level of satisfaction in taking these tools used to automate dating and transforming them into a tool to automate making excuses not to try dating. Normally, when one considers pushing the boundaries of video games, one considers technological advances, such as the photorealistic graphics of many shooters. The boundaries I’m primarily interested, however, are storytelling ones: how often are games made about the same warriors, detectives, and animals? What real-world dramas could we convert into games that have seldom been already? For this project, I made a game out of two of these dramas: sexual harassment and whistleblowing. Cassandra is an adaptation of the Greek myth, wherein a priestess is blessed by the god Apollo with the gift of foresight, but cursed by him after she rejects his advances. From then on, her foresight would never be believed; consequently, her warnings about the Trojan War are ignored. This game puts the player in the shoes of Cassandra, here an office worker at a large American oil company. 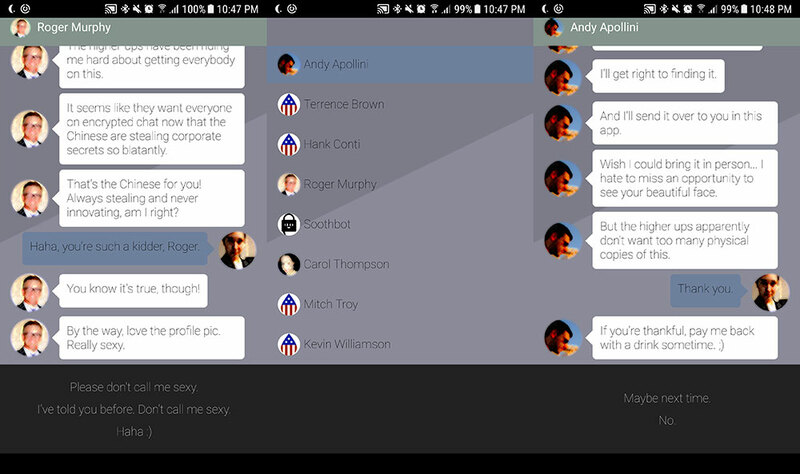 In a simulated messaging app, you discover company secrets and communicate with your peers in a real-world stretch of time. Can we use computers to create traditional art? Some of my research has been in the field of computational aesthetics, chiefly rendering photographs into a painterly style. 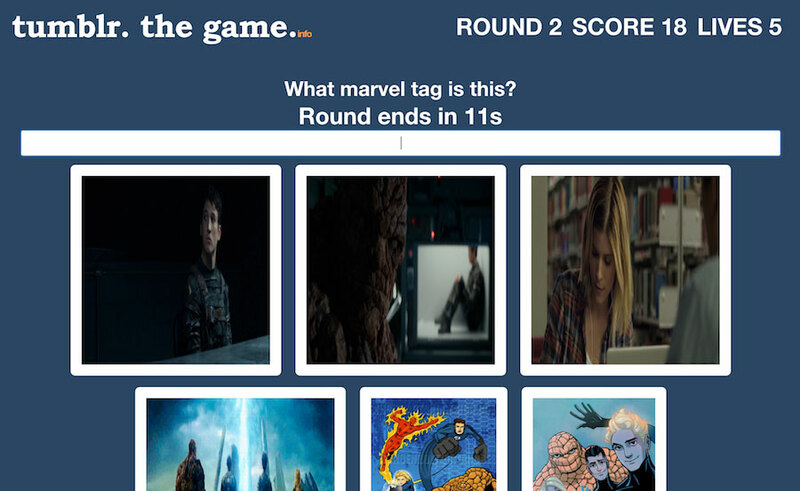 (See an OFX version) It’s an interesting field, working with computer vision problems, image parsing and semantics, and pure art history. 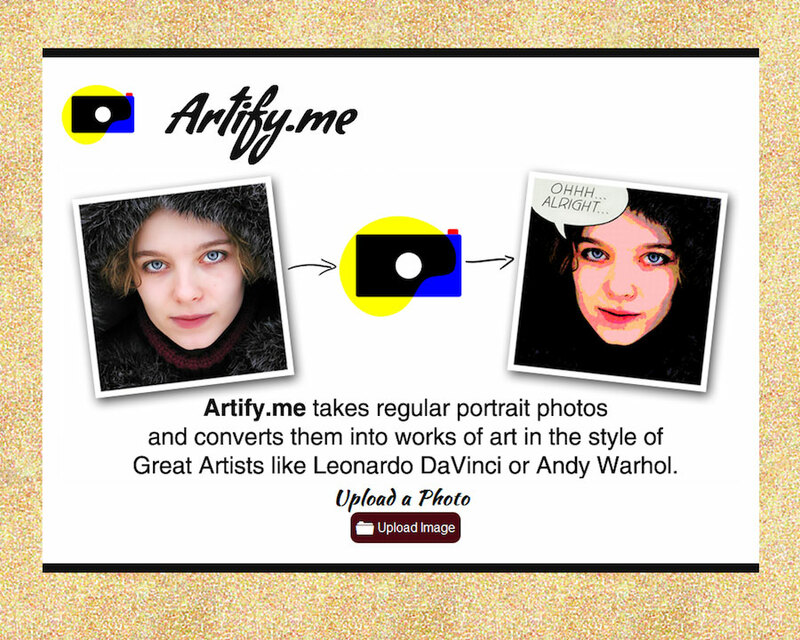 Artify Me is a web application built on top of Ruby on Rails to manipulate portrait paintings to look like works of art. Unfortunately, it was built on Face.com’s Facial Detection API, which has shut down since its acquisition by Facebook. The Lichtenstein and Warhol morphs still work though, and you can check them out. First, I studied these artists’ work to decompose them into essential recognizable elements, and then performed manipulations to imitate these elements. For the more complicated pieces, one would recognize your facial features and fade a painted portrait’s features into them producing a synthesized piece of art. At my graduate school, there’s a constant need for batteries. One might be prototyping electronics and need them for power, or one might use an audio or video recorder that only takes AAs. Consequently, a friend of mine, Lindsey Daniels, and I decided to start selling batteries to our fellow students. It’s cheaper than buying them from CVS, and usually more convenient too. The downside of this is that we can only sell when one of us is physically around, so we decided to create a vending machine to sell them when we aren’t around. 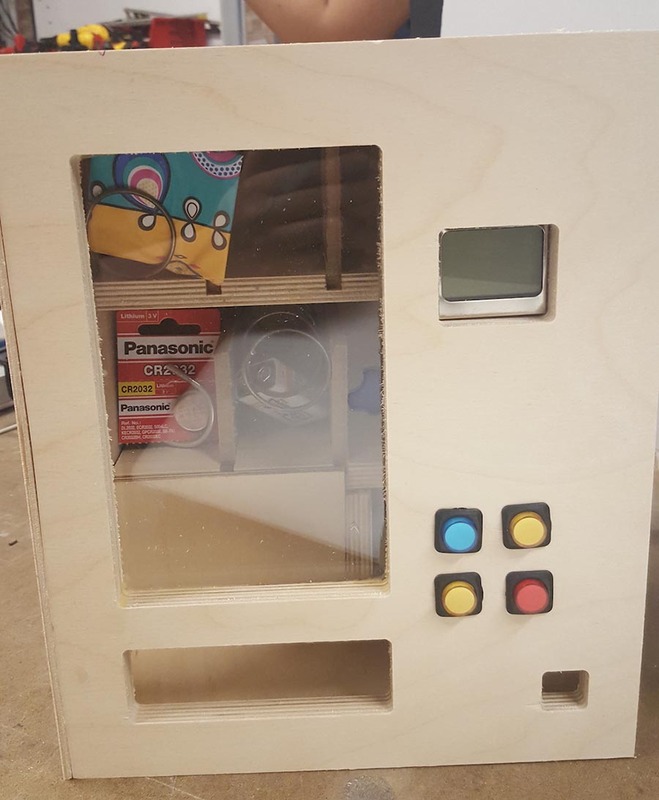 The project took many different skill sets– the housing was built using plywood and the CNC router, it is powered by an Arduino that we programmed, and it connects to a web API of my own design. If you are ever at ITP, please check out the vending machine in person! 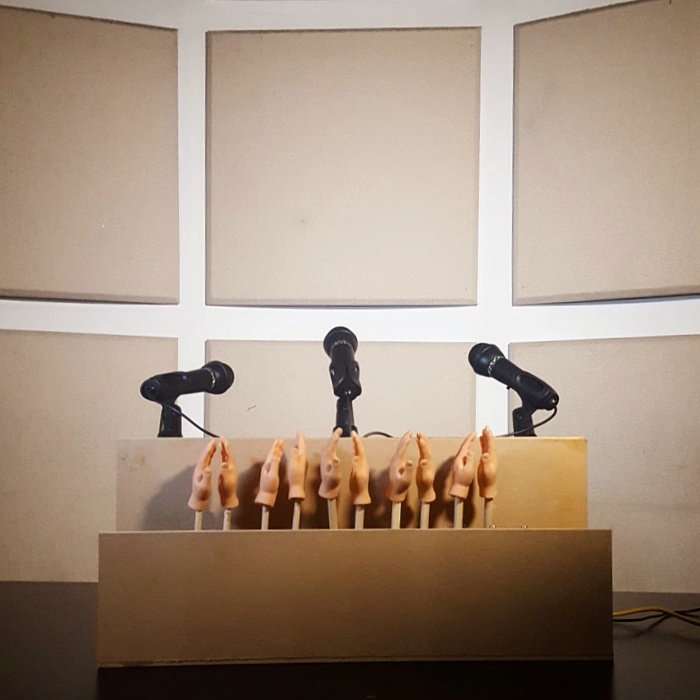 The idea behind Captive Audience was to create an object that expresses gratitude towards anybody who speaks into it. In summary, it’s a clapping machine. There were many motivations behind this project. It was inspired by the nascent presidency of Donald Trump; he bragged about his standing ovations from the FBI and other audiences, seemingly unaware that the applause was coerced or otherwise forced. If the president could express such pride for what was ultimately an empty gesture, why shouldn’t you or I feel this great? Consequentially, I created this machine. But pride like this isn’t exclusively the territory of the president; motivational speakers, athletes, and other speakers likely get similar treatment. It’s not a political piece necessarily, but rather it speaks to the human capacity to imagine reasons behind arbitrary events. The hands are not clapping for anything you’ve really done, but it feels like they are. It also speaks to the human capacity to personify objects– these hands have no feelings. But you still feel like they’re appreciating you. 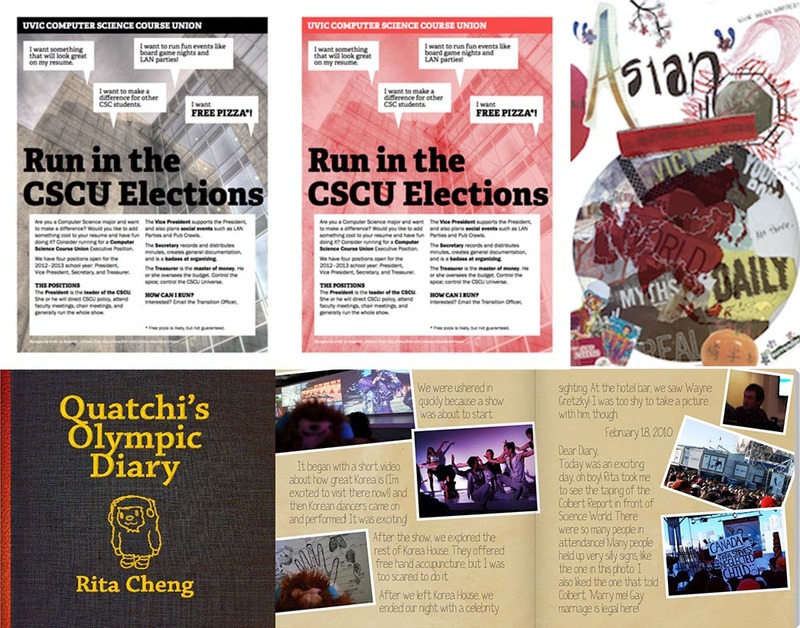 I’ve also, on occasion, done print design, copy writing, and editing. Working within different limitations can be a real boon creatively. I start by researching and reviewing current materials, then brainstorm and design compositions, create proofs, and do final reviews. With brand development, you want to create a visual identity that encapsulates the brand, connotes the right feeling, and informs the project’s total design. 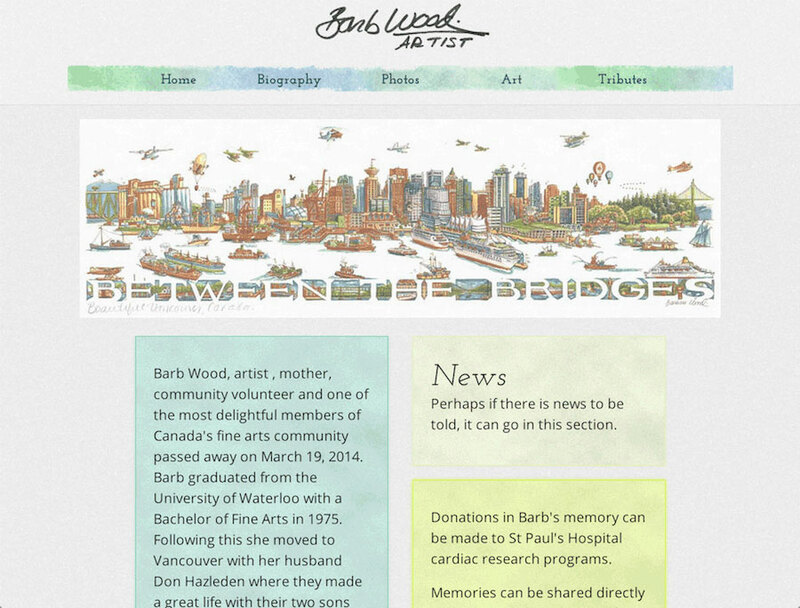 After the illustrator Barb Wood passed away, her husband requested that I transition her website from that of a working artist to a memorial page. I submitted several designs and transitioned the webpage from hand-coded HTML to using a PHP framework, Pico. or maybe you're more into Programming Graphic Design Weird Things ?